This is the first of a series of blog posts related to the next OpenERP 8.0 (or should I say Odoo 8.0). This first post will be very “seeking for orientation” on major new features and changes. Don’t expect anything to be deeply commented or analyzed. I will probably devote several posts for changes in some modules, but in this one I’ll just write about things that can be immediately seen when you first install it. I’m working with a clone from the now official github.com odoo repository. Of course I’m using the branch “8.0” for this review. The first I noticed is that several new requirements are in place, and the pyPdf requirement had been forgotten. Second thing noticed is that unlike the “7.0” you don’t need to run the openerp-server script passing the --addons-path=./addons. In 8.0 they include this path automatically. So running ./openerp-server is enough. Also the python setup.py sdist command includes this path as well, so a properly built distribution from source seems more doable. I haven’t tried this yet, but I will, cause that was for sure something missing in 7.0. It’s quite suspicious that the tarball is too small (around 13MB) though. Once I ran the server I installed a demo DB to see what’s new. The first thing that captured my attention was an “Instant Messaging” module. I gave it a try and it seemed to work out-of-box. It uses the quite old long polling technique instead of the brand new HTML5 Server-Sent Events (SSE) stuff. Why? My first guess was that multi-process deployments would need to pass messages around between the HTTP processes. That requires a kind of Inter-Processes Communication (IPC). Popular choices for achieving this in web applications are Redis and RabbitMQ, but then you’d need to setup either for this to work. 2014-08-27 22:53:48,972 17858 ERROR o8 openerp.http: Exception during JSON request handling. The highlighted line says this won’t work in a multi-process deployment. How do you get to use the evented mode, I don’t know. Probably that’s the default now. So I need to review this feature more closely before going to production. It’s a nice addition though. I found they have now a GeventServer for long polling connections. And the implementation of the Instant Messaging Bus (bus.py) can be easily adapted for desktop-like notifications, updating your message inbox, and many other features that would benefit from this. 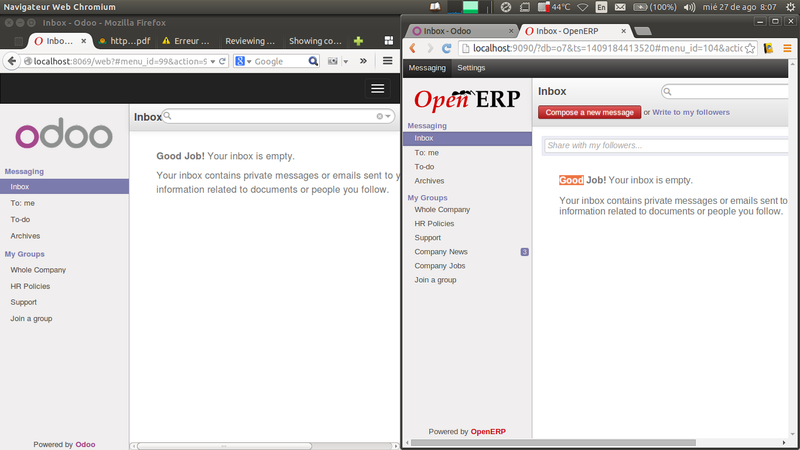 Odoo is missing the “Compose new message” button. I then installed the “Employee directory” addon and the “Share with my followers” box appeared. order to ease the choice and simplify options. is accessible with the 'write to my followers' text box alread present in the inbox. The action is available from the wall. After reverting this commit, the icon is reestablished. But, then I realized that the feature, however hidden, is actually there: If you click on the “Share with …” and instead of writing your message there, click on the “expand” icon, then you get the same as pressing the (now missing) email icon. I think that the icon is required, though, since now the “Share…” box is not shown until HR is installed, and the email icon allows to send email to outsiders. My current employer is willing to remove email in favor of this messaging module. This may hold him back. I’m raising my hand to vote for the rescue of (at least) the icon. Redundancy is not always bad when it comes to user interface. This enough for this post. I’ll keep looking at Odoo and I’ll write about it. « Apples and Oranges. How books can mislead our thinking process.